on May 3, 2016 at 11:51 am Is “Capitalism” a Dirty Word and “Liberal” a Good Word? The angle of the hockey stick will change depending on how much freedom individual initiative is allowed to have, and how motivating the effort-reward curve is allowed to remain. In other words, the angle of the stick going into the future will be strongly affected by how strangulating the natural voter tendency towards coercive collectivism will be. Those societies that give their most productive and creative members freedom to produce, and reward their efforts by letting them keep the fruits of their exceptionalism, will grow faster, along a steeper hockey stick. Those societies that do not follow the free market/ steeper effort-reward curve values will still grow (after all the genie of human growth is irreversibly out of the bottle). But their growth will be much slower, and thus into compounding wretched decline compared to the fast rising world average. After all, a mere 2% lag in annual growth quickly compounds into a seven fold difference (yes that is over 700%) over a century. But as I said many times: To the average voter, a redistribution dollar today is worth seven perpetually compounding growth dollars into the future. Hence, few electorates will escape that natural tendency. Understand that the hockey stick does not only represent riches but also a standard of living. 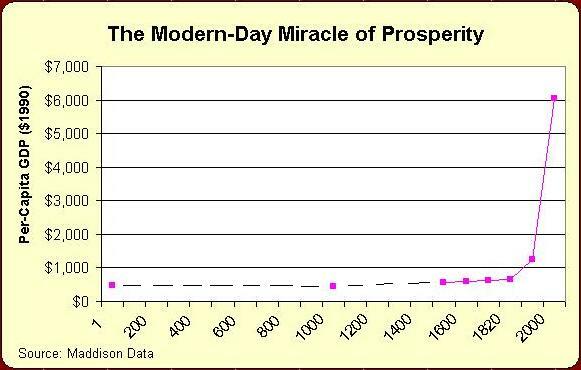 Prosperity (i.e. the total pie) has actually grown even more than the hockey stick implies. A king in 1600 could not afford penicillin, and his wealth only had a modest impact on his chances of surviving pneumonia. The cure, penicillin, was simply not available at any price. A poor person today can easily buy this cure on a mere few hours of work. Similarly, a person today cannot afford a cure for cancer and his wealth only has modest effect on his survival probabilities. I speculate that a cancer cure will be available for everyone in one hundred years, perhaps much sooner. What Steve Jobs could not have with billions, a common chap in 2114 will be able to buy on a few hours of labor. So, the angle of that hockey stick will likely determine not only riches but also whether your children get to finally live in a world free of cancer, or whether your lineage will have to wait until your grandkids or great grandkids for such fantastical things – i.e. for such a fantastically large pie! In another concrete but speculative example, cracking the very mechanism of aging might already be on the horizon. Intervention at the molecular level to halt or even reverse the effect may not be far behind. Life expectancies well beyond our imagination may become common in the next century. After all, nature has already cracked the issue, that is why we have moths who live a few days and turtles that can live over a century, and both are successful species (*). I actually do not know what the specific fantastical capabilities of the next century will be. I can only speculate about things I see in the horizon, mostly in my line of work. And the horizon that can be seen is much less than one hundred years. Really, who can possibly see one century into the future? Imagine some pundits in 1914 trying to come up with a worldwide plan for the next one hundred years. Nothing that they say would make sense. And the changes that we are likely to see between 2014 and 2114 are greater than those that occurred between 1914 and 2014, because the pace of change keeps accelerating. That is why those who predict climatic planetary catastrophe are so pathetic. Predicting climatic calamity requires you to know two things: The state of the climate AND the state of humanity – One hundred years into the future! The first might actually be relatively easy to model and predict (though if you ask a group of people whose job and livelihood depends on continued alarmism, you may not get an unbiased answer). But the second necessary component? Who in their right mind can claim to be able to predict the fantastical state of 22nd century humans? Like 1914 pundits trying to predict life in 2014. Total nonsense would come out of their mouths and Heavens have pity on us had they been able to impose their plans on the entire planet (as we are pathetically trying to do now). At this point, people with the natural tendency towards coercive collectivism (i.e. most people) will ask: Isn’t it then a matter of smart dirigisme? Coercively redirecting, for example, more resources into cancer research or the biology of longevity in general? No. Because the solution to these problems, like many seemingly intractable problems past, cannot appear by themselves in a vacuum and will most likely come from unexpected sources, or a series of unexpected sources. We cannot predict and manage those sources. Fixed pie mentality people have a pathetically myopic horizon. Imagine debating a number of experts/pundits at a public forum in 1880. Supposed you said. I want growth and entrepreneurship to run free. I have big dreams, I want my children to… to… for example… fly! Fly?!?? You would have been quickly discounted by the pundits as a non-serious infantile dreamer. The debate moderator would have told you, “Nice and noble dream Mr. Liberty, but let’s move on to some more prescient earthly topics, like,… say,… redistribution after next month’s election”. Yet, who was right? Of course, you would have likely not guessed flying as a specific fantastical thing of the next century, just as WE cannot guess the fantastical things to come in the 22nd century. But fantastical they will be. Will America still be in the lead? Will the American middle class be the first to gain access to the fantastical new things that will become the future new norm for a decent standard of living ? (after all, a person who lives 90 years in a world where most live 220 has a wretched destiny you know). Yes, if Americans stick to the distinct founding principles of this country that once set them apart from therest of the world: Laissez faire capitalism and the motivation of self-sufficiency with the steeper effort –reward curves it implies. Will it really happen for Americans? I severely doubt it given the current cultural moth-towards-the-light-of-HopNChange, Euro-copycat trajectory. So instead, American prosperity leadership will get the death spiral. Having initiated their slower growth relative decline through the flatter effort-reward curve of HopNChange, the only immediate way for the American middle class to hang on to their top worldwide prosperity rank amidst a slower growing pie is …. drumroll please…. ….. : more and more redistribution!! Yes, I believe that after two centuries American prosperity has finally entered the classic death spiral taken by many one electorates before. The rising billions of this planet have neither the desire nor the patience to wait and see how American experimentation with HopNChange coercive collectivism ends. The rising humanity of competition will take no prisoners. American top rank prosperity has entered the self-inflicted spiral that many one electorates in other places naturally chose. Citizens of other jurisdictions will be the ones to experience the fantastical new century things first. (*) BTW, why does nature not make every species long lived since it knows the aging mechanism? Because nature has no interest in the longevity of individuals, only the success of the species (yes in a way nature is communist — but that does not mean we have to and our success in many ways depends on sidestepping nature – sorry hippies) hence the short lived moth is as successful as the long lived turtle. I sometimes wonder if the cost of regulation- which we all agree some of it is necessary- is not greater than the value it brings by simply opening the flood gates for additional regulation. In other words, if we completely de-regulated the economy, there would undoubtedly be some cheaters, and some graft, and such, but does the cost of regulation and the fraud that comes with it outweigh the initial value it brings? Perhaps a TRUE laissez-faire economic approach would balance out as the better solution. I doubt we’ll ever know as no society will ever try it. And should it ever be tried by some utopian society- as soon as the first person cheated, there would be laws set in place to stop whatever was tried. Thanks Dan. I cite Deirdre’s fine work in my own book Credentialed to Destroy: How and Why Education Became a Weapon to show that Radical Ed Reform endangers the source of prosperity it takes for granted as available for redistribution. Right now both the OECD and UN entities are pushing an Equity/Great Transition needs agenda that assumes that everyone’s needs can be met globally if citizens in the West will learn to live with less material comfort. The Ford Foundation is pushing this as the so-called Line of Plenty. Everybody is wrongfully assuming a fixed pie. Deirdre helps us appreciate why that mistake is so crucially wrong.